One of the most common accidents that take place on construction sites are falls from vehicles. In fact, falls represent a third of all accidents involving workplace transport. The Health and Safety Executive confirmed that in 2017/18, 31% of employer-reported non-fatal injuries were caused by slips and trips. It’s estimated that 95% of major slips result in broken bones and can be the cause of a range of other types of accidents, such as a fall from a height. Not to mention the incalculable human cost, such as the loss of personal income, injured pain from the accident, potential reduced quality of life and the worry and stress that serious injuries can bring, even post-recovery. Whilst there has been a general downward trend of both self-reported and employer-reported non-fatal injury since 2000/01, we still think more can be done. We at AE Faulks are committed to plant operation safety. As a result, we have strived to ensure the equipment we hire out is maintained to the highest possible standard and that further safety features are implemented where possible to continue to improve this. Here’s a look at how we’ve implemented safety features into our tracked and wheeled excavators. When performing maintenance on excavators, it’s vital that safety features are in place to protect workers from any potential hazards. Take for example, the Komatsu PC210-10, which has thermal guards placed around high temperature parts of the engine. The fan belt and pulleys are well protected and in case of damage, fire risk is reduced by pump/engine partition that prevents hydraulic oil from spraying onto the engine. Cleaning the PC210-10 couldn’t be easier, with its hinged air conditioning cooler and side-by-side radiator and oil cooler allowing for easy access. The engine oil filter, the fuel filters and the fuel drain valve are mounted remotely to make them accessible from ground level. Soot trapped in the diesel particulate filter is periodically and automatically oxidised using the heat from the engine exhaust. Easy routine maintenance enhances the levels of productivity and availability of machines. The ZAXIS 135US excavator has a series of convenient and quick solutions, such as the interior anti-dust filter which has been placed on the outside of the air conditional condenser and fuel cooler, away from the fan so that dust and particles can be caught evenly, without them collecting in one place. Accessing and egressing equipment such as excavators can be a hazardous task and this is the moment where accidents such as slips and trips are most likely to occur. In order to add further safety features to our excavators and help to minimise the slip and trip risk, AE Faulks have highlighted the point of contact handrails, grab rails and access steps with high visibility paint. This is to maximise the visibility of these points of contact as the most high-risk areas, giving workers the reassurance of where they’re stepping/grabbing to minimise the risk of slips and trips. Our excavators have been fitted with the highest safety standards when it comes to their operation. The Komatsu PC210-10, for example, has an audible travel alarm to promote on-site safety, as well as highly durable anti-slip plates with additional high-friction covering to maintain long-term traction performance. It also has a rear-view camera which gives an exceptionally clear view of the rear work zone on the wide-screen monitor panel. The low-profile camera is adjustable and integrated into the counterweight’s shape. To minimise the risk of incorrect use or mistakes during operation, our excavators have been designed with user-friendly functionality in mind. 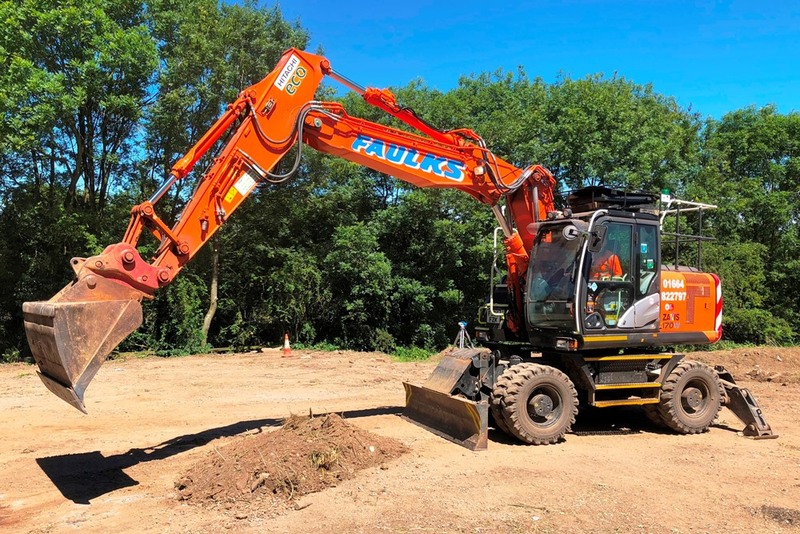 The ZAXIS 225US excavator has a multi-function LCD monitor with a seven-inch screen that provides a wide range of useful technical information, including clear indication of the machine’s status and settings with multi-lingual support in up to 32 languages. The monitor and ergonomically designed switches have been grouped together within easy reach of the right hand. The proportional switch in the optional, auxiliary function lever allows for easy control of the front attachment. At AE Faulks, safety is paramount. We always strive to provide plant equipment that has been rigorously tried and tested to ensure it is up to the highest possible standard of health and safety. If you’re looking for plant hire in Leicester, contact us today to find out about our services and the plant equipment we can offer for your next project.